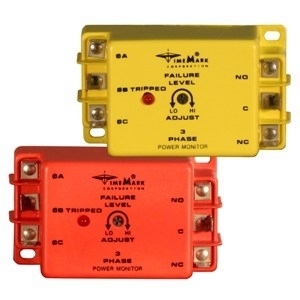 The Model 158 continuously monitors 3-phase power lines for abnormal conditions. When properly adjusted, the Model 158 monitor will detect phase loss on a loaded motor even when regenerated voltage is present. This device consists of a solid-state voltage and phase-angle sensing circuit, driving an electro-mechanical relay. 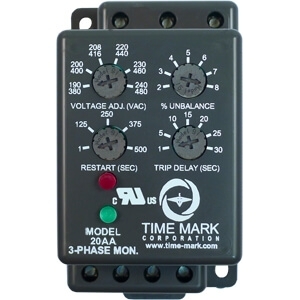 When correct voltage and phase rotation are applied, the internal relay will energize. A fault condition will de-energize the relay. When the fault is corrected, the monitor will automatically reset. The Model 158 does not require a neutral connection, and can be used with Wye or Delta systems. Four versions cover 120V, 208/240V, 480V (60Hz) and 380V (50Hz). Voltage ranges are sufficient to allow for proper adjustment to existing conditions. A front-mounted LED failure indicator is provided. 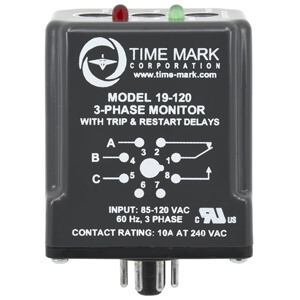 The R versions of the Model 158 monitor have an additional LED indicator for RESTART and a 5 minute short cycle timer, to delay restarting the motor.